A New Threat to the U.S.
During the Cuban Missile Crisis, leaders of the U.S. and the Soviet Union engaged in a tense, 13-day political and military standoff in October 1962 over the installation of nuclear-armed Soviet missiles on Cuba, just 90 miles from U.S. shores. 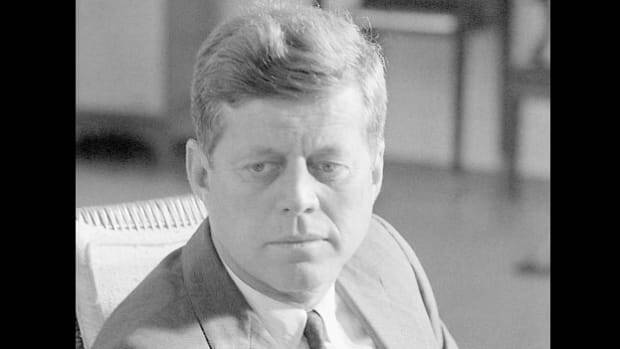 In a TV address on October 22, 1962, President John Kennedy (1917-63) notified Americans about the presence of the missiles, explained his decision to enact a naval blockade around Cuba and made it clear the U.S. was prepared to use military force if necessary to neutralize this perceived threat to national security. Following this news, many people feared the world was on the brink of nuclear war. However, disaster was avoided when the U.S. agreed to Soviet leader Nikita Khrushchev’s (1894-1971) offer to remove the Cuban missiles in exchange for the U.S. promising not to invade Cuba. 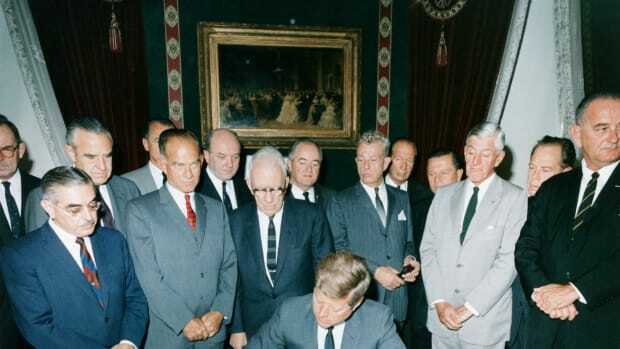 Kennedy also secretly agreed to remove U.S. missiles from Turkey. After seizing power in the Caribbean island nation of Cuba in 1959, leftist revolutionary leader Fidel Castro (1926-) aligned himself with the Soviet Union. 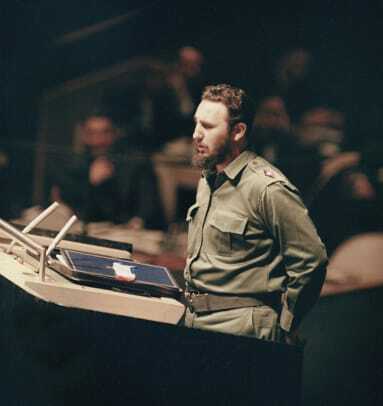 Under Castro, Cuba grew dependent on the Soviets for military and economic aid. During this time, the U.S. and the Soviets (and their respective allies) were engaged in the Cold War (1945-91), an ongoing series of largely political and economic clashes. Did you know? The actor Kevin Costner (1955-) starred in a movie about the Cuban Missile Crisis titled "Thirteen Days." Released in 2000, the movie&apos;s tagline was "You&apos;ll never believe how close we came." The two superpowers plunged into one of their biggest Cold War confrontations after the pilot of an American U-2 spy plane making a high-altitude pass over Cuba on October 14, 1962, photographed a Soviet SS-4 medium-range ballistic missile being assembled for installation. President Kennedy was briefed about the situation on October 16, and he immediately called together a group of advisors and officials known as the executive committee, or ExCom. For nearly the next two weeks, the president and his team wrestled with a diplomatic crisis of epic proportions, as did their counterparts in the Soviet Union. For the American officials, the urgency of the situation stemmed from the fact that the nuclear-armed Cuban missiles were being installed so close to the U.S. mainland–just 90 miles south of Florida. From that launch point, they were capable of quickly reaching targets in the eastern U.S. If allowed to become operational, the missiles would fundamentally alter the complexion of the nuclear rivalry between the U.S. and the Union of Soviet Socialist Republics (USSR), which up to that point had been dominated by the Americans. 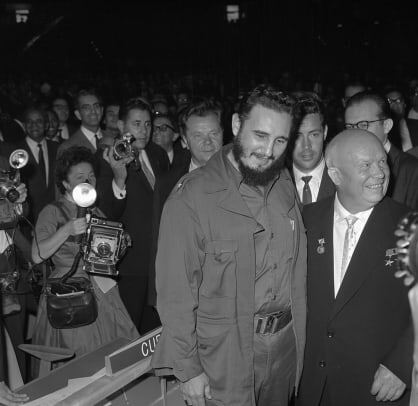 Soviet leader Nikita Khrushchev had gambled on sending the missiles to Cuba with the specific goal of increasing his nation’s nuclear strike capability. The Soviets had long felt uneasy about the number of nuclear weapons that were targeted at them from sites in Western Europe and Turkey, and they saw the deployment of missiles in Cuba as a way to level the playing field. Another key factor in the Soviet missile scheme was the hostile relationship between the U.S. and Cuba. 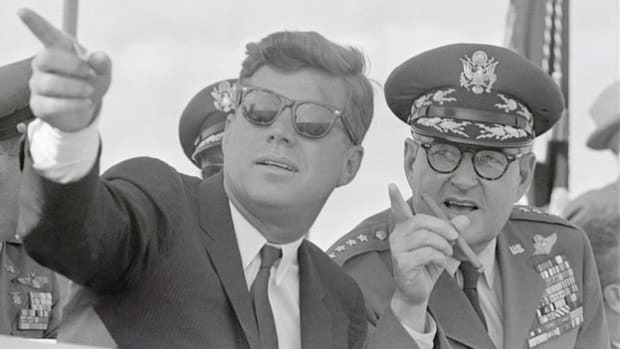 The Kennedy administration had already launched one attack on the island–the failed Bay of Pigs invasion in 1961–and Castro and Khrushchev saw the missiles as a means of deterring further U.S. aggression. 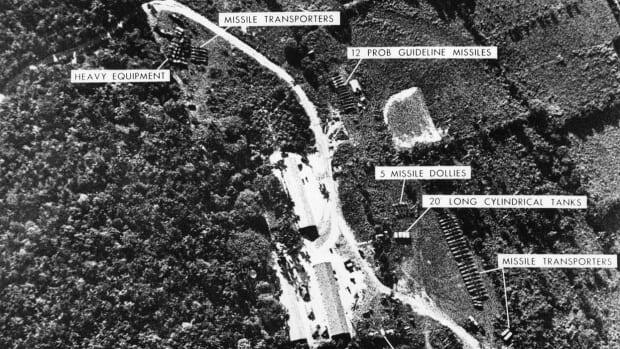 From the outset of the crisis, Kennedy and ExCom determined that the presence of Soviet missiles in Cuba was unacceptable. 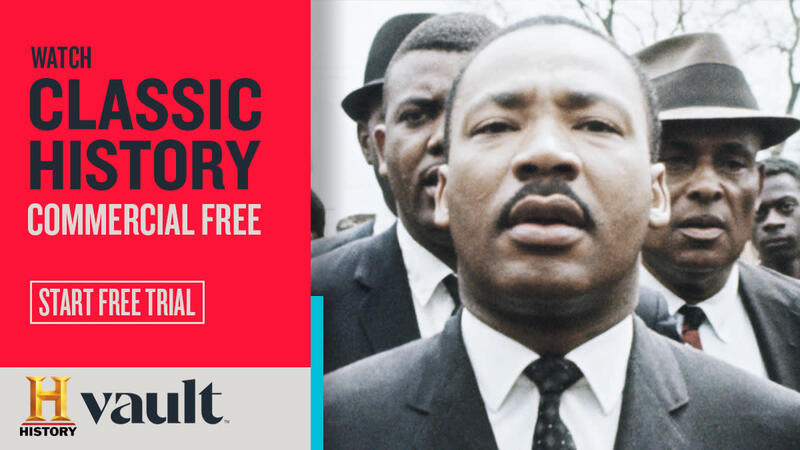 The challenge facing them was to orchestrate their removal without initiating a wider conflict–and possibly a nuclear war. In deliberations that stretched on for nearly a week, they came up with a variety of options, including a bombing attack on the missile sites and a full-scale invasion of Cuba. But Kennedy ultimately decided on a more measured approach. First, he would employ the U.S. Navy to establish a blockade, or quarantine, of the island to prevent the Soviets from delivering additional missiles and military equipment. Second, he would deliver an ultimatum that the existing missiles be removed. In a television broadcast on October 22, 1962, the president notified Americans about the presence of the missiles, explained his decision to enact the blockade and made it clear that the U.S. was prepared to use military force if necessary to neutralize this perceived threat to national security. Following this public declaration, people around the globe nervously waited for the Soviet response. Some Americans, fearing their country was on the brink of nuclear war, hoarded food and gas. 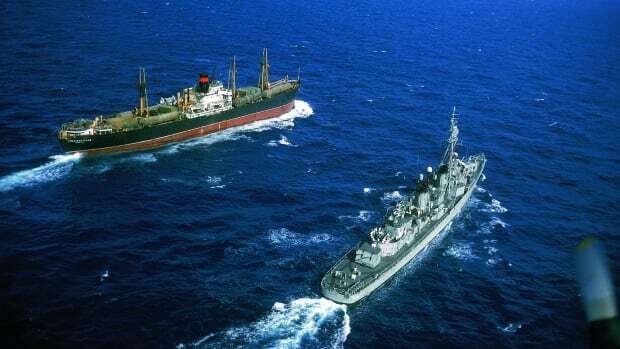 A crucial moment in the unfolding crisis arrived on October 24, when Soviet ships bound for Cuba neared the line of U.S. vessels enforcing the blockade. 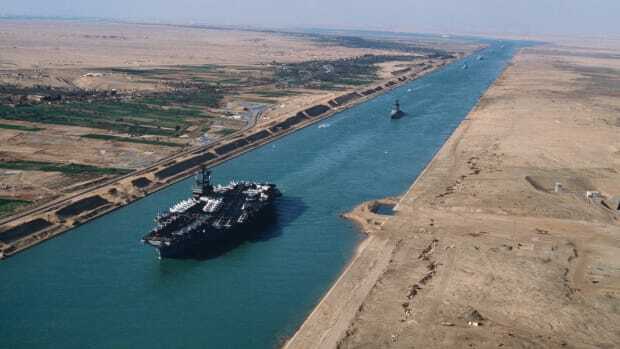 An attempt by the Soviets to breach the blockade would likely have sparked a military confrontation that could have quickly escalated to a nuclear exchange. But the Soviet ships stopped short of the blockade. Although the events at sea offered a positive sign that war could be averted, they did nothing to address the problem of the missiles already in Cuba. 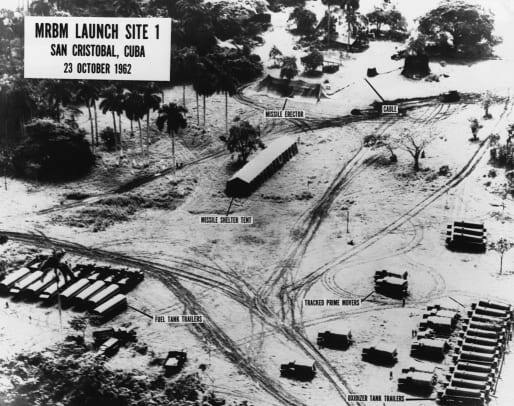 The tense standoff between the superpowers continued through the week, and on October 27, an American reconnaissance plane was shot down over Cuba, and a U.S. invasion force was readied in Florida. (The 35-year-old pilot of the downed plane, Major Rudolf Anderson, is considered the sole U.S. combat casualty of the Cuban missile crisis.) “I thought it was the last Saturday I would ever see,” recalled U.S. Secretary of Defense Robert McNamara (1916-2009), as quoted by Martin Walker in “The Cold War.” A similar sense of doom was felt by other key players on both sides. Despite the enormous tension, Soviet and American leaders found a way out of the impasse. During the crisis, the Americans and Soviets had exchanged letters and other communications, and on October 26, Khrushchev sent a message to Kennedy in which he offered to remove the Cuban missiles in exchange for a promise by U.S. leaders not to invade Cuba. The following day, the Soviet leader sent a letter proposing that the USSR would dismantle its missiles in Cuba if the Americans removed their missile installations in Turkey. Officially, the Kennedy administration decided to accept the terms of the first message and ignore the second Khrushchev letter entirely. Privately, however, American officials also agreed to withdraw their nation’s missiles from Turkey. U.S. Attorney General Robert Kennedy (1925-68) personally delivered the message to the Soviet ambassador in Washington, and on October 28, the crisis drew to a close. Both the Americans and Soviets were sobered by the Cuban Missile Crisis. The following year, a direct “hot line” communication link was installed between Washington and Moscow to help defuse similar situations, and the superpowers signed two treaties related to nuclear weapons. The Cold War was far from over, though. In fact, another legacy of the crisis was that it convinced the Soviets to increase their investment in an arsenal of intercontinental ballistic missiles capable of reaching the U.S. from Soviet territory.